Richard Oakes, Who Occupied Alcatraz For Native Rights, Gets A Birthday Honor : The Two-Way The late activist and Google doodle honoree stormed the island with dozens of other activists in 1969, citing a century-old treaty in claiming it for Native Americans. He would have been 75 on Monday. Richard Oakes, seen in November 1970, led a group that occupied Alcatraz from November 1969 to June 1971. 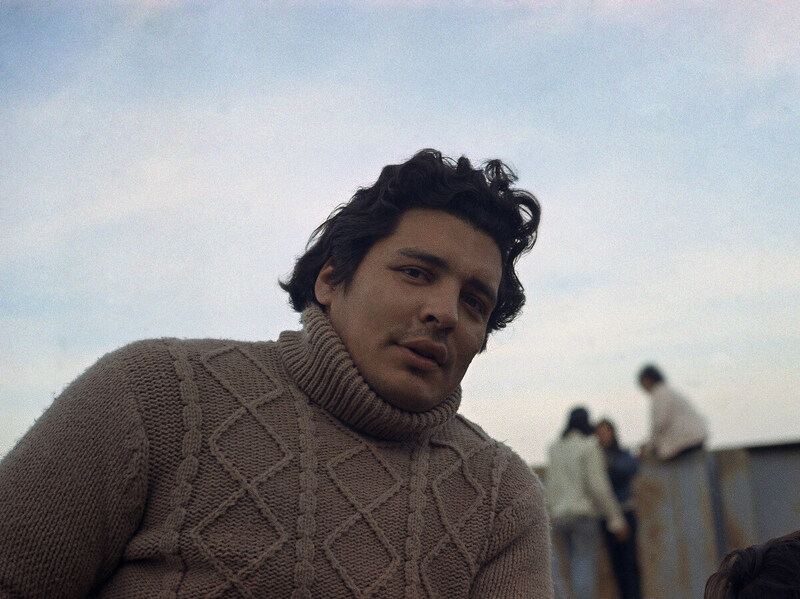 In November 1969, Richard Oakes and dozens of his fellow Native American activists came ashore at Alcatraz. The little island in San Francisco Bay had lain dormant since 1963, when its infamous federal prison had been shut down, and the group Oakes led set out to claim the land as its own. The Indians of All Tribes had a century-old legal basis: the 1868 Fort Laramie Treaty between the U.S. and the Sioux and Lakota, which they said returned defunct federal lands to native people. They announced that, by the terms of this treaty, Alcatraz could be legally claimed as theirs. And so Oakes and his compatriots stayed. That day commenced a 19-month occupation of the island that attracted national attention to native rights and catapulted Oakes into wider notoriety and acclaim — such acclaim, in fact, that nearly five decades later, Google is celebrating his birthday with a doodle in his honor. "The aim was not only to set up a community, complete with a university, museum and cultural center, but also for the government to acknowledge the rights of American Indians to claim the out-of-use federal land as their own," the tech giant writes in a blog post. "Although Richard didn't succeed in gaining the deeds to Alcatraz for his people, he brought their issues into the media spotlight and made a substantial impact on the treatment of American Indians in the US." "There's just a dual sense of justice in this country," Oakes said in an interview just days after the occupation began. "We'd like an end to this. And I think this — manning the island of Alcatraz — is a positive step in that direction. If they're going to treat us separately, then we'll remain separately." Within half a year, though, the occupation began to splinter and weaken as many of the original occupiers returned to their daily lives and were replaced with others, some of whom rejected the Mohawk activist's leadership and pursued different aims. "The final blow to the organized leadership occurred on January 5, 1970, when Oakes's 13 year old stepdaughter fell three floors down a stairwell to her death," the National Park Service writes. "Following Yvonne's death, Oakes left the island and the two competing groups maneuvered back and forth for leadership on the island." It would be another year and a half before federal law enforcement stormed Alcatraz and removed the few remaining occupiers. "The success or failure of the occupation should not be judged by whether the demands of the occupiers were realized. The underlying goals of the Indians on Alcatraz were to awaken the American public to the reality of the plight of the first Americans and to assert the need for Indian self-determination. As a result of the occupation, either directly or indirectly, the official government policy of termination of Indian tribes was ended and a policy of Indian self-determination became the official US government policy." Before that occupation even ended, Oakes was on to his next fight, taking part in the Pit River Indians' attempts to reclaim tribal land in Northern California. And once more he had little difficulty grabbing national headlines, joining the tribe in resisting not only Pacific Gas & Electric — the company that had laid claim to the land — but U.S. law enforcement, too. He was killed in 1972 under murky circumstances, after a confrontation with a white man turned violent. Though Oakes was unarmed, the man who shot him dead was acquitted of manslaughter on grounds of self-defense.